”If neurotic is wanting two mutually exclusive things at one and the same time, then I’m neurotic as hell. I’ll be flying back and forth between one mutually exclusive thing and another for the rest of my days.” – Sylvia Plath (1932-1963), U.S. poet. The narrator, in The Bell Jar, ch. 8 (1963). How many of us today can relate our writing to intensely personal trials? We first set pen to paper to discover an outlet. We find our voices through the arrangement of words. Writing is our therapy. We scour every line to see if there might be a more accurate way to present emotion through poetic device and even after a poem is posted on our blogs or published for the world to critique, it is never finished. Precision is as elusive as happiness and contentment, but one poet managed to define the moment when a gasp can no longer be restrained, Sylvia Plath. Even in death, her voice cries out from the depths, bottomless and potentially overwhelming. Sylvia Plath was born in Boston, Massachusetts in 1932 to Otto and Aurelia Plath. Two and a half years later, her brother was born. Her father, Otto, taught at Boston University and was an expert on bees, so much so that he published a book titled Bumblebees and Their Ways. When Plath was eight years old, her father died of diabetes mellitus, a curable disease that he failed to recognize and address. For several years, Otto thought that he had cancer only because his health was precarious. He had lost a close friend to lung cancer and his pessimistic self-diagnosis led him to believe that nothing could be done about his health. Otto’s death, the first major tragedy in Plath’s life, would haunt her. Plath’s first published poem appeared in the Boston Herald when she was eight years old. She was an honor student and following high school, she was accepted into Smith College on scholarship where she first experienced the pressures of academics and social interactions. Plath began writing journals at age twelve, highly descriptive entries that became a source of inspiration for her poetry. Perhaps her most memorable passage is one in which she writes of the joys of picking her nose which to me seems an odd place to dig for inspiration. Journaling was only one side of her literary outlet. She also wrote structured poems, expertly-crafted but without the depth of her later works. She was well-read and tried very hard to emulate influential poets of her time. Years later, she abandoned the structure as she gave her personal turmoil permission to grace the page. Once that happened, she became a poet that will be remembered. She submitted poems and articles regularly for publication although rejection letters far outweighed acceptance. In 1950, her work started appearing in national periodicals and local newspapers. She won first prize in a Madamoiselle contest for her short story, “Sunday at the Mintons,” and following this success, hoped to receive admittance to a Harvard summer class on writing. Unfortunately, Harvard rejected her application, an event that marked the end of Plath’s journals as if in an abrupt turn, her confessional writing needed to take a back seat to personal privacy. She exposed some of her emotional journey through letters to close friends and in her novel, The Bell Jar, but the daily outpouring ceased. In 1953, Plath wrote a short note, “Have gone for a long walk. Will be home tomorrow.”, took a blanket, a bottle of sedatives and a glass of water to the space under the screened in porch and attempted suicide. She did not fear death and years later, succeeded in taking her own life. In 1956, Plath married Ted Hughes, an event that likely became the catalyst for her poetic freedom. They had two children together. Following six years of turbulence, they agreed to separate and suddenly, like a dam had burst, Sylvia wrote dark and biting poem after poem, twenty-five over a period of one month. These poems were collected and published in 1965 in her book Ariel. The Moon and the Yew Tree, perhaps one of her most elegant poems, was written during this period of Plath’s life. 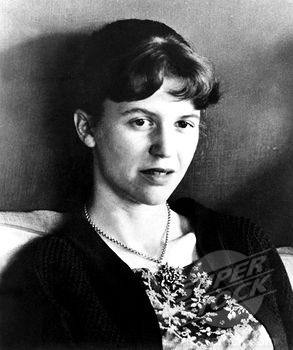 In December of 1962, Plath was living in a London apartment with her two children. The winter was incredibly cold, an atmospheric anchor to her already fragile psyche. She wasn’t writing poetry over these months, rather she spend time writing fictional prose. Her book, The Bell Jar, was published under a pseudonym in January, 1963. The Bell Jar, extremely personal and candid, had been rejected by her American publishers, yet once published, met with positive reviews. No one knows exactly what happened in the last six days of her life. It is believed that the following poem, “Edge,” was her final poem. “Edge” is so personal, so dark, that even the most hardened soul shivers at its reading. I believe that what she doesn’t say may be the most unsettling element. © the Estate of Sylvia Plath. Faber and Faber Ltd and the Estate of Sylvia Plath from Collected Poems published by Faber and Faber at £17.99. On February 11, 1963, Sylvia Plath took her own life. She stuffed rags under the doors to protect the children, left a note by the phone for someone to call her doctor, then put her head inside of the gas oven. Most believe that she did not mean to succeed in this attempt. She had timed the attempt to her neighbor’s schedule and left a note requesting help. The gas odor should have lowered into the apartment below her and signaled an emergency to her neighbor who would have found her in time. It didn’t happen that way. Thank you for joining me for Pretzels & Bullfights. I wish we could sit around a fire with a glass of wine and actually have a conversation about Sylvia Plath and her works. I don’t feel I can do her justice in a short blog article. I hope I piqued your curiosity or brought to mind a Plath line or two that leads you back to her work. I love that phrase. She also used a line that spoke of a ceiling without stars, a vivid sense of absence. Thanks very much. “An odd place to dig for inspiration.” So very funny, and a great essay on Sylvia Plath. I really enjoyed the post today, Beth! A bit like Marilyn Monroe – she never had to face a decline. How horrid for those who loved her. I hadn’t thought of that. Thank you! The last poem you quoted implies she felt she might have peaked, and only descent remained. Wow, I am intrigued with her words and lives. I am thrilled to discover a new (to me) poet to explore ~I find her fascinating and her words, strike a cord within me, for sure! Thanks so much, Beth. You might try reading some of her early work when she wrote structure, then transition to her later voice. It will help you see her growth. Thanks very much. that should have said ” life” not ” lives”…sneaky spell check. I wonder how many poets and poetesses have committed suicide.. I think that every 20th century poets I love in Sweden did it… Do we need to be close to the edge to really write in a way it moves our hearts?.. I loved reading the Bell Jar, but knowing how it ended I really feel an extra strong reason. Wonderful article Beth. Thank you. I believe that poets are able to know the edges of emotions, the depths of darkness. Some are more fragile than others. Plath had a history of emotional instability. I don’t believe she wanted to commit suicide. I believe that both attempts were a cry for help. In the first, although she had enough sedatives to perish quickly, she doled them out to herself, keeping herself in a near-comatose state for a couple of days until she was found. There were pills left in the bottle. The fatal attempt has too many markers of a plea to have been her intended end. Close to the edge, or completely over it, yes, I do believe. That was superb — thanx so much for sharing. I highly recommend reading her journals; I find them to contain far more intriguing “poetry” than her poems. Although, “The Edge” is a remarkable poem. Of further note is that Sylvia’s son also committed suicide a few years ago. sylvia plath always fascinated me since i started writing poetry…. Thank you for your penetrating summary of Plath’s turbulent life. I knew the outline of the story but you have filled in a lot of the blanks for me. What an excellent article, Beth. I have always liked the work of Sylvia Plath. She left us way too soon. Thanks, Mary. When she set her words free of form, her poetry crested the mountains. Yes, she left way too soon. Thanks, Beth; I must read The Bell Jar again….I would like to have known her. I opened my email notification of this post and shivered. Sylvia Plath is my literary idol. Her brutally frank and venomous word choice is nearly debilitating in its beauty. I read her collections and I could cry over the sheer inertia that her lines strike you with. You’re a punching bag and each little letter bestows a blow. God, I love her. Plath has always fascinated me, along with Dian Arbus. Two women in pre-feminist America who could not keep a grasp. I believe that for Plath, marriage was actually her undoing. Having children, the natural consequence of pre-Pill wedlock, may have sapped her energies. No matter how the note and towels under their doors…it seems sad she was so isolated, she really didn’t grasp the consequences in store for those little ones. I was pretty much obsessed with Sylvia Plath in my adolescence (aren’t we all, at least the girls?). Then I took a little distance from her, thinking she was too confessional (and because she had become too much of an idol for so many less accomplished poets). But I’m rereading her now, not just out of biographical curiosity, but because I really admire her style. This is no raw confessional – it is very carefully crafted, poised, hard-hitting and universal poetry. One of the most compelling biographies I’ve read was about her–can’t remember the name right now. It’s so important to be able to correlate life and poetry. Beth– a wonderful article. You know Ted Hughes destroyed her diaries which I always thought was just a terrible thing for him to do. He could have had them sealed for a period of years, etc. Thanks for your wonderful essay. k.